It all started on 18th January, 2016, over two years ago, when PEGAS received an email from Gregg Tully, Executive Director of the Pan African Sanctuary Alliance. “My name is Maria Silva. I am a post-doctoral researcher working in Guinea-Bissau. 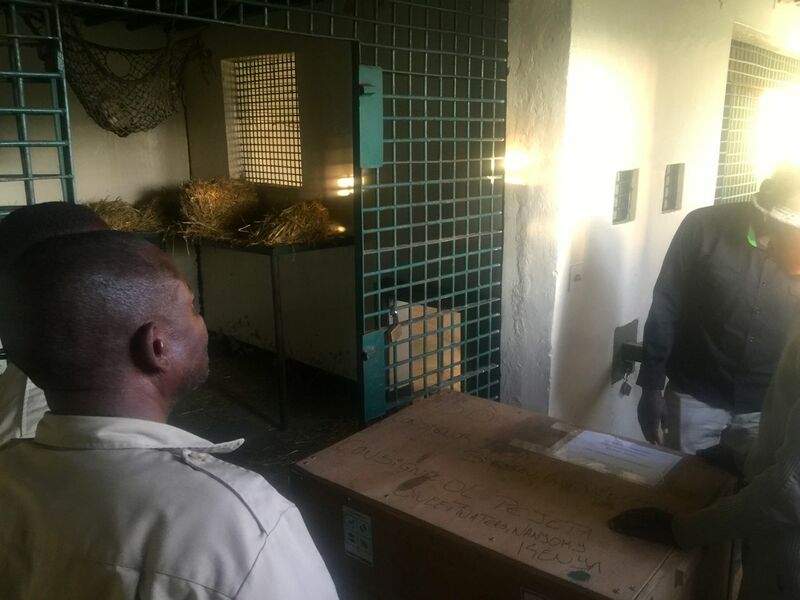 PEGAS received confirmation from Richard Vigne, CEO of Ol Pejeta Conservancy, and Dr. Stephen Ngulu, manager of Sweetwaters Chimpanzee Sanctuary, that they would be happy to receive chimps from Guinea Bissau. 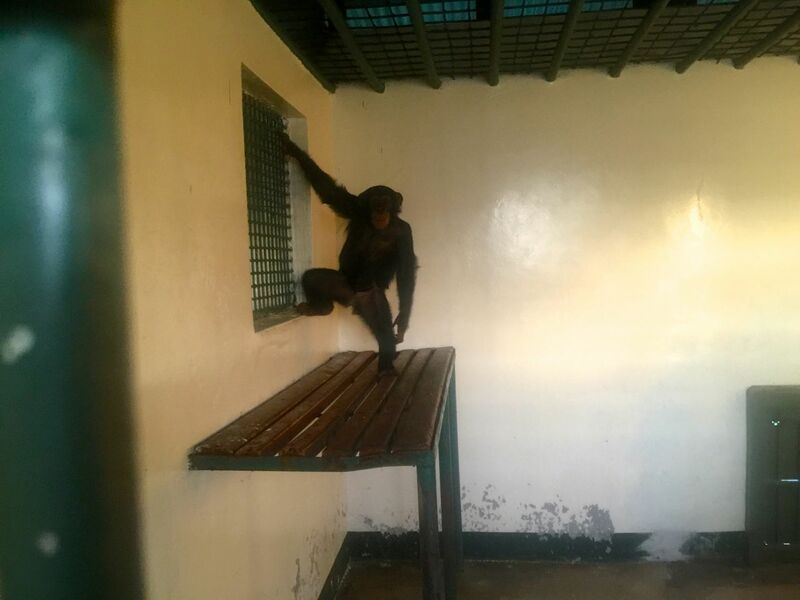 Maria Joana informed us that there was one particular chimpanzee, named Bo, who was ready to go. 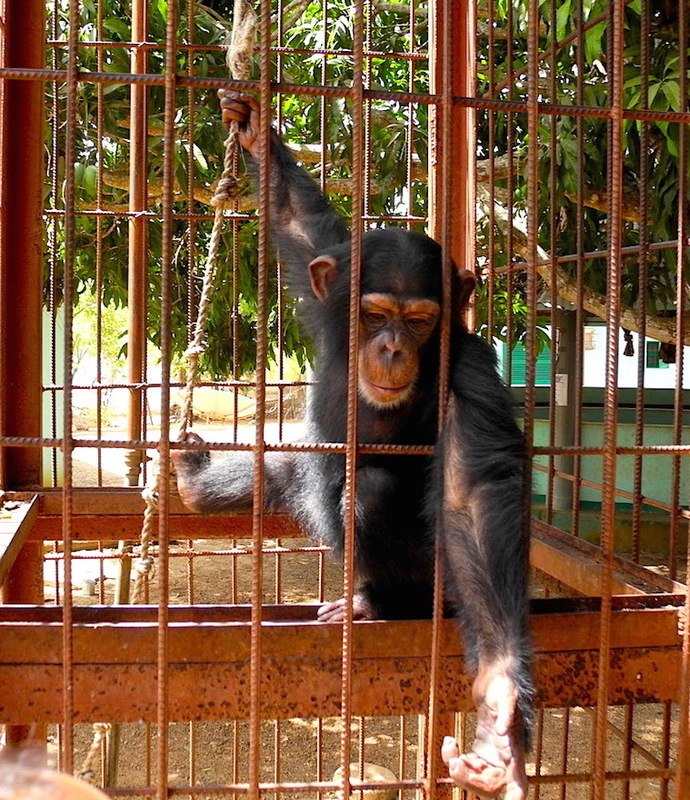 Bo had been seized by the authorities from a man who was trying to sell her after killing her mother for bushmeat. 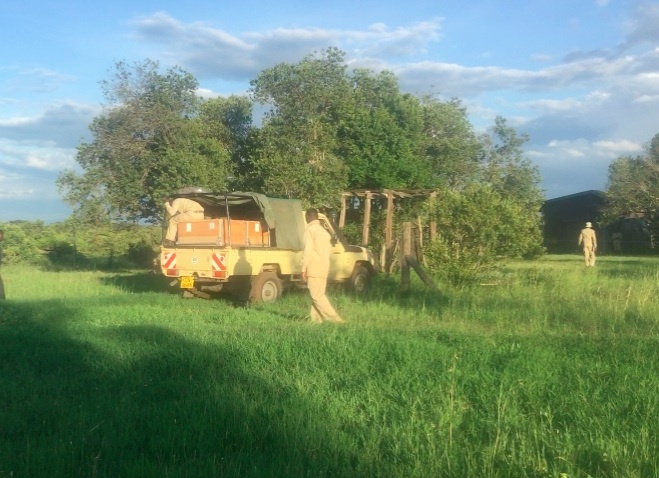 She was being kept at Cufada Lagoon National Park. They thought she was about three years old. 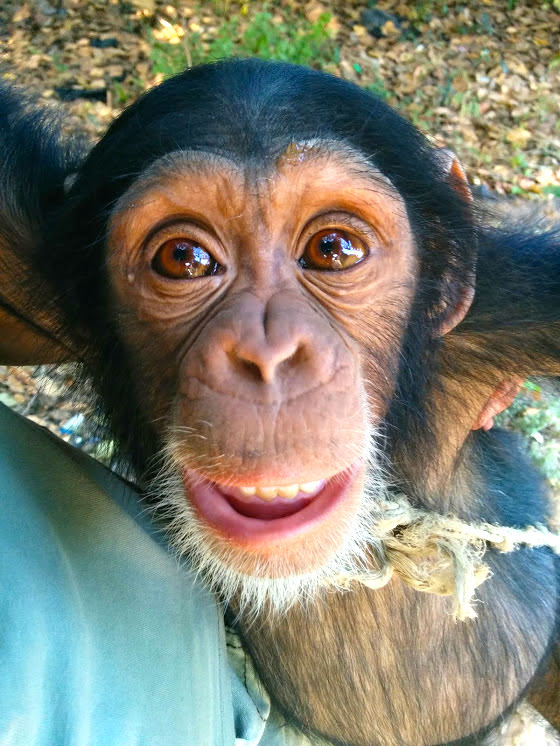 Bo, now around four or five years old, has spent the last two years at the Cufada Lagoon National Park waiting for relocation to Sweetwaters. 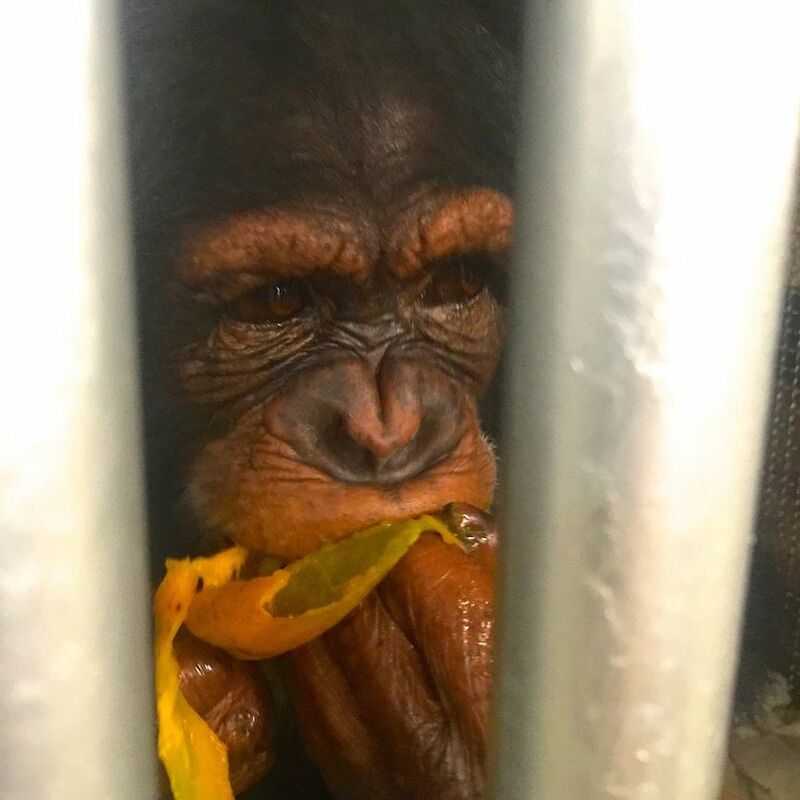 Bo has received many visitors and likes humans, but now she will have to learn how to be a chimpanzee. Following on that initial email some hundreds of them ensued, along with Facebook and WhatsApp messaging and Skype calls, involving dozens of people – Maria Joana, Guinea Bissau national parks and CITES people, the Guinea Bissau European Union delegation (they had generously offered to cover transport costs), Kenya Wildlife Service and Kenya Department of Veterinary Service staff, Portuguese volunteer veterinarian Pedro Melo who took bio-samples from Bo, Hank Nephuis of the Biomedical Primate Research Centre in the Netherlands which analyzed the samples and issued a health report, and many other supporters who helped out in various ways. PEGAS was at the center of this maelstrom of communications, which was hampered by the fact that Internet service in Guinea Bissau was spotty and the country was experiencing considerable political instability during this period, not to mention language difficulties (Guinea Bissau is Portuguese-speaking). 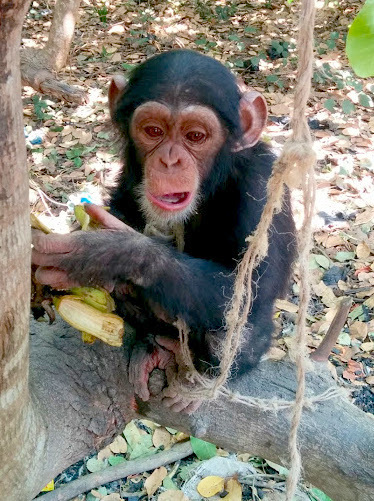 Later on another young chimp was added, Bella, a shy and sensitive female who found herself in the same painful situation as Bo – orphaned victim of bushmeat hunting and target of the exotic pet trade. Bella, perhaps three years old. Maria Joana Silva, who pushed the rescue and relocation from day one to the successful conclusion. 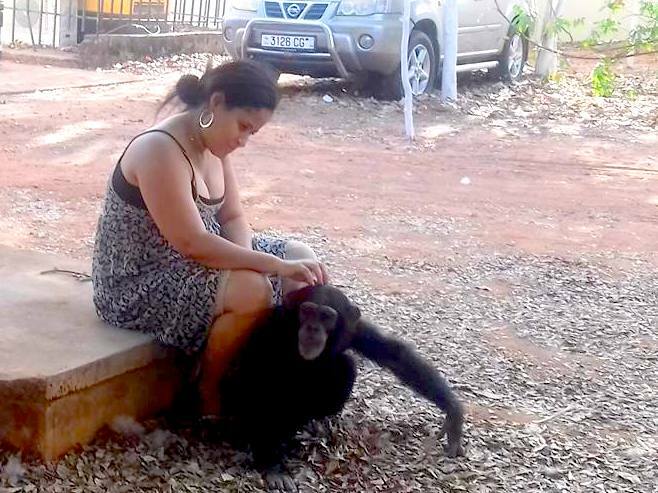 Ms Aissa Regalla, Coordinator of Species and Habitats in the Instituto da Biodiversidade e das Áreas Protegidas (IBAP) (Institute of Biodiversity and Protected Areas), the Guinea Bissau wildlife service, who helped obtain the necessary paperwork. Aissa Regalla of IBAP came to care a lot for Bo. 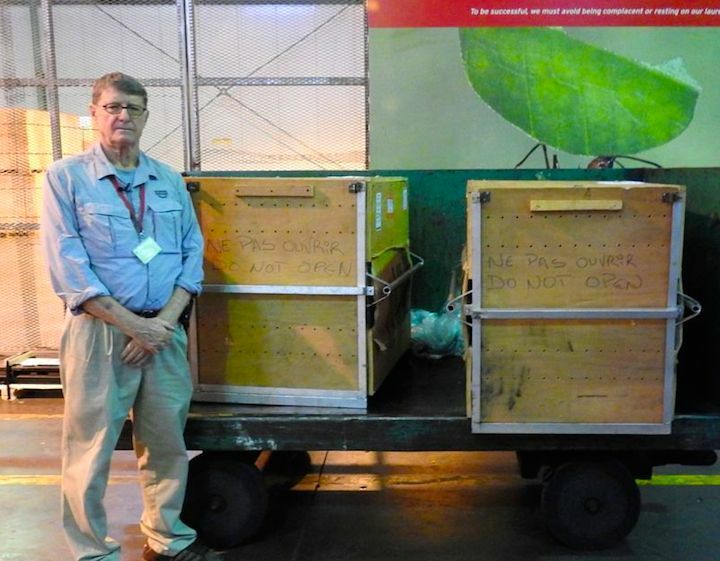 Pedro Melo, wildlife veterinarian, who flew to Guinea Bissau from Lisbon to take the samples needed for the veterinary tests, and who supervised the shipping from Bissau to Dakar and then ensure that the crates got onto the Kenya Airways flight from Dakar to Nairobi. Helena Foito and Carla Da Silva-Sorneta, European Union Delegation. Fai Djedjo, Guinea Bissau CITES Focal Point. 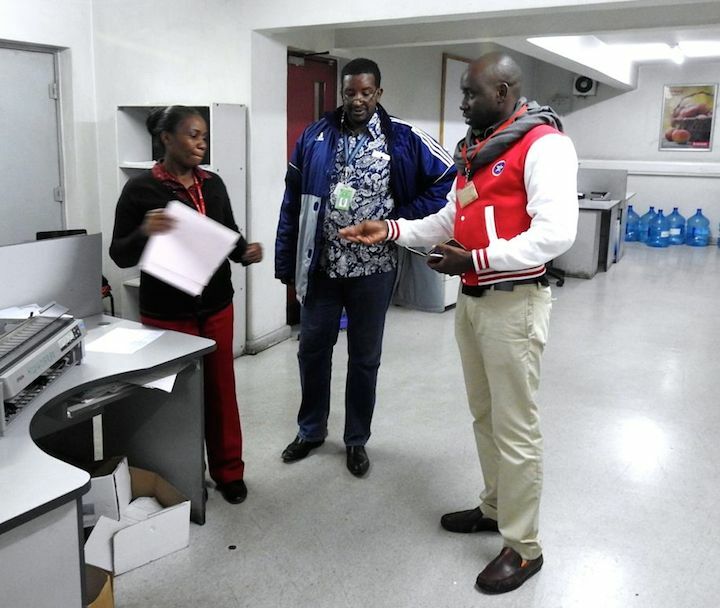 Richard Vigne, Stephen Ngulu and Samuel Mutisya of Ol Pejeta Conservancy, who were kept busy writing letters and emails for all of the permits and shipping documents required, and who carried out the transport from Jomo Kenyatta International Airport to Ol Pejeta. 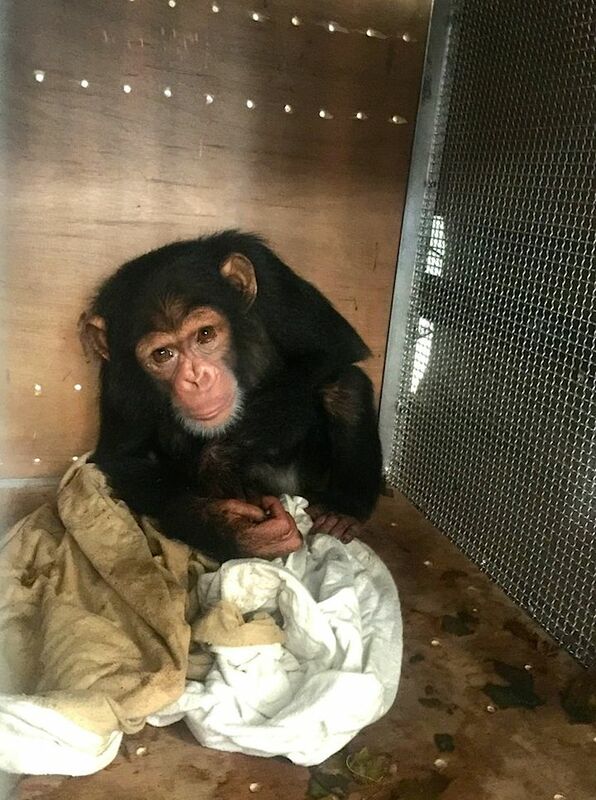 Ramat Hamoud of Airfreight & Logistics Worldwide, who handled the complicated clearing of the chimps at the Nairobi airport. After more than two years of work, Bo and Bella finally touched down on Kenyan soil at 5:13 a.m. on 26th April, 2018. Karibuni Kenya! 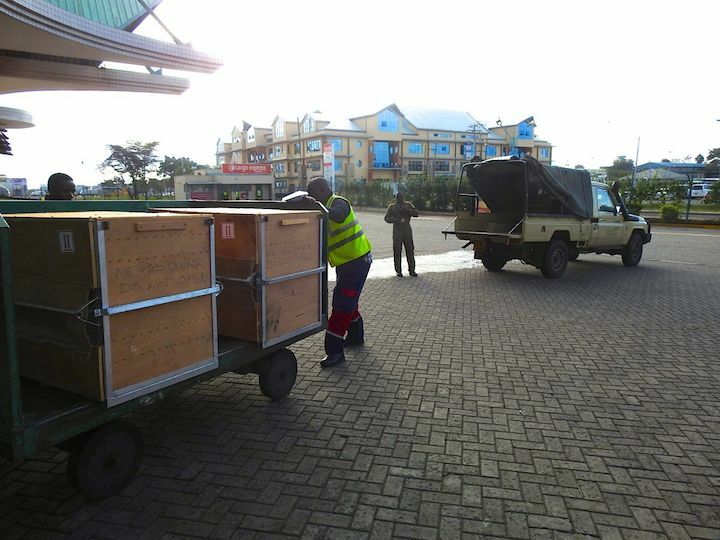 Here are a few photos of the arrival and transport to Sweetwaters Chimpanzee Sanctuary. 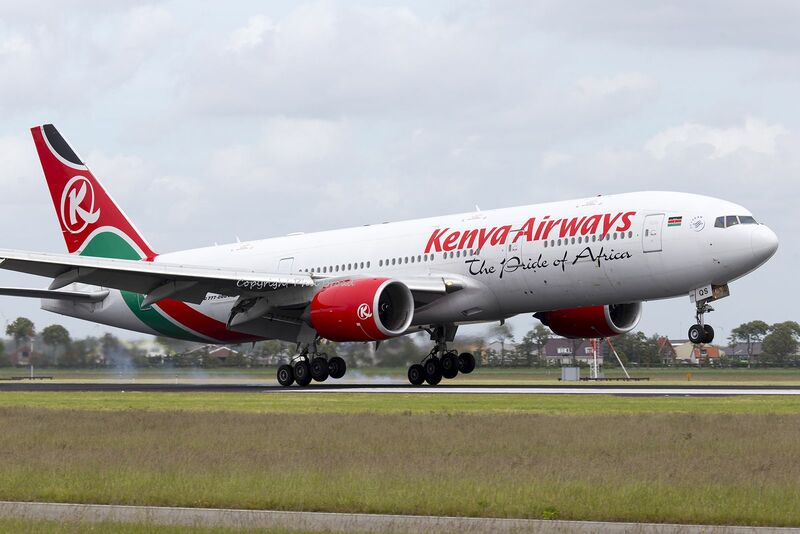 KQ 513 landed at 05:13 carrying Bo and Bella across the African continent. 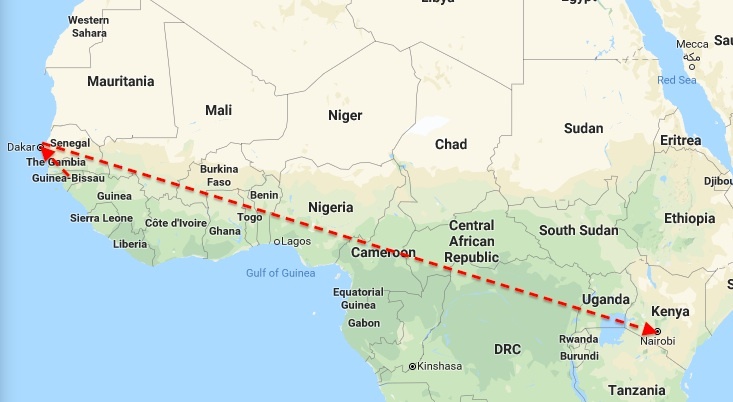 The entire trip, with transit in Dakar, took 18 hours. 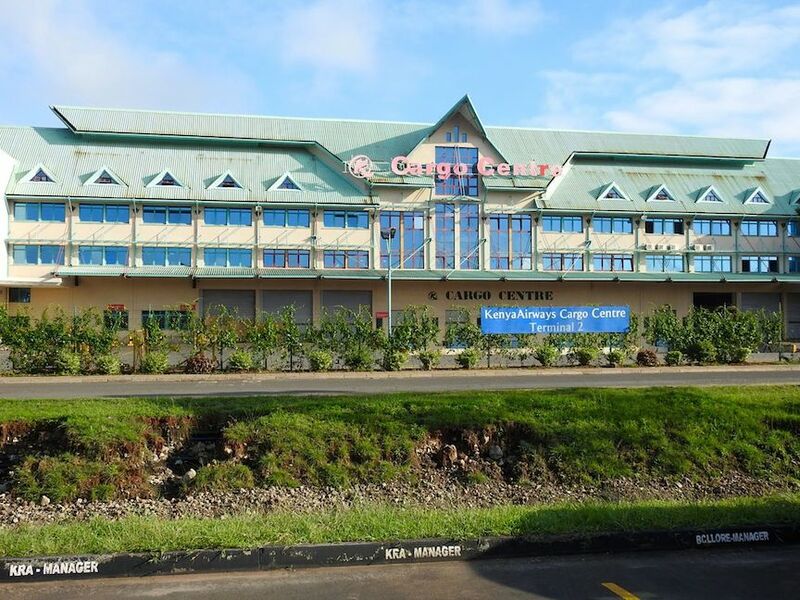 I arrived at 06:15 at Kenya Airways cargo to find no one there, except two sleepy staff, who knew nothing about any cargo arriving from Guinea Bissau. Luckily I had the Airway Bill scan on my phone to show. 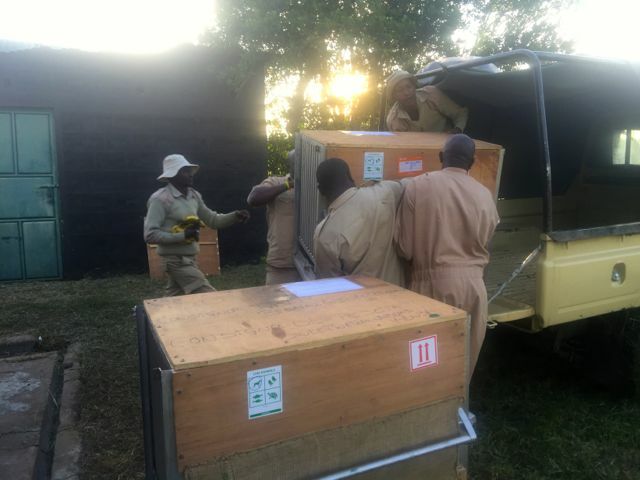 While the staff were checking their computer for information on the chimp crates, I walked out into the cargo area and found the crates right there a few meters from the office door. 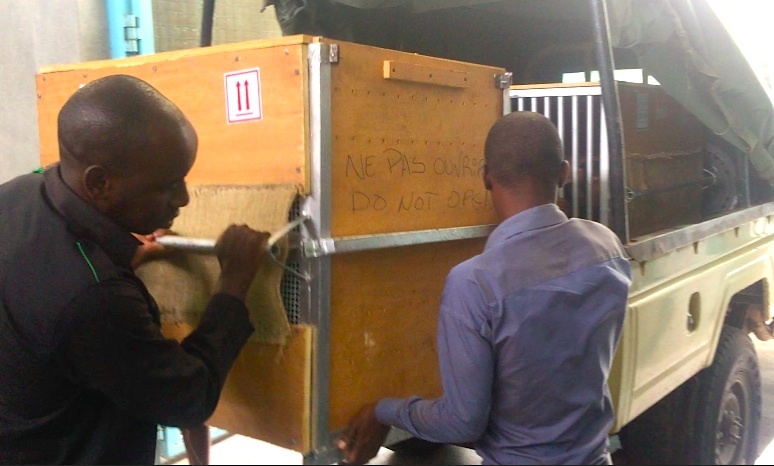 Some time later Stephen Ngulu, Sweetwaters manager, arrived with Dr. Rashid, the airport veterinarian. 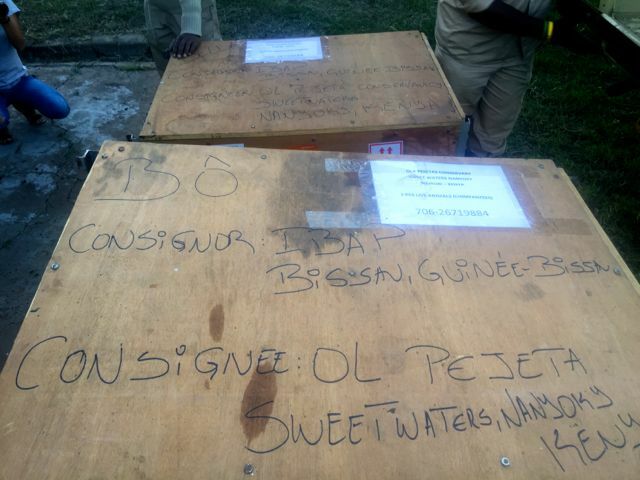 KQ Cargo would not allow Dr. Ngulu to take possession of the crates without a letter from Ol Pejeta authorizing it. Richard Vigne, CEO, was in New York, so his deputy Samuel Mutisya rushed a letter to KQ Cargo by email. Ramat Hamoud, the clearing agent, arrived later and began the laborious clearing process. 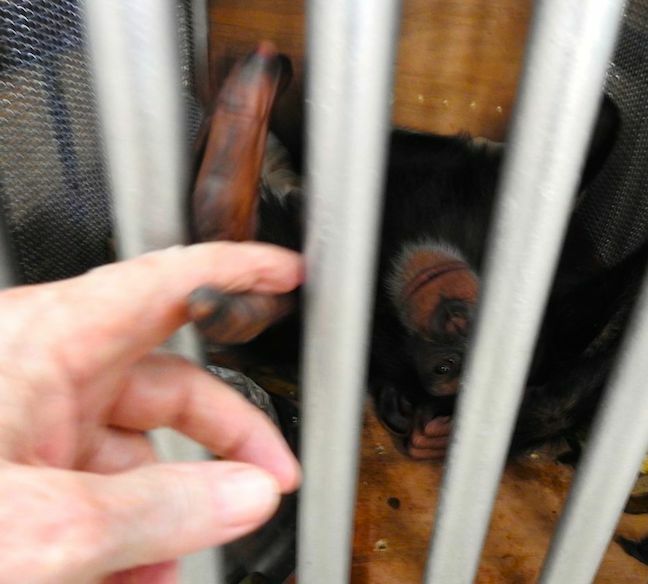 We took the chimps to the airport animal holding facility for the veterinary formalities. The doors were opened so we could see how they were doing (I actually peeked earlier in the cargo shed). Bo offered me his finger, first touch! Bo looked in remarkably good spirits after what must have been a tiring and confusing experience. And it wasn’t over yet. Bella was a bit more subdued, but she came around later and became quite friendly. Her face had the clear color of a Central African chimp. Bo had a mango to celebrate her arrival. 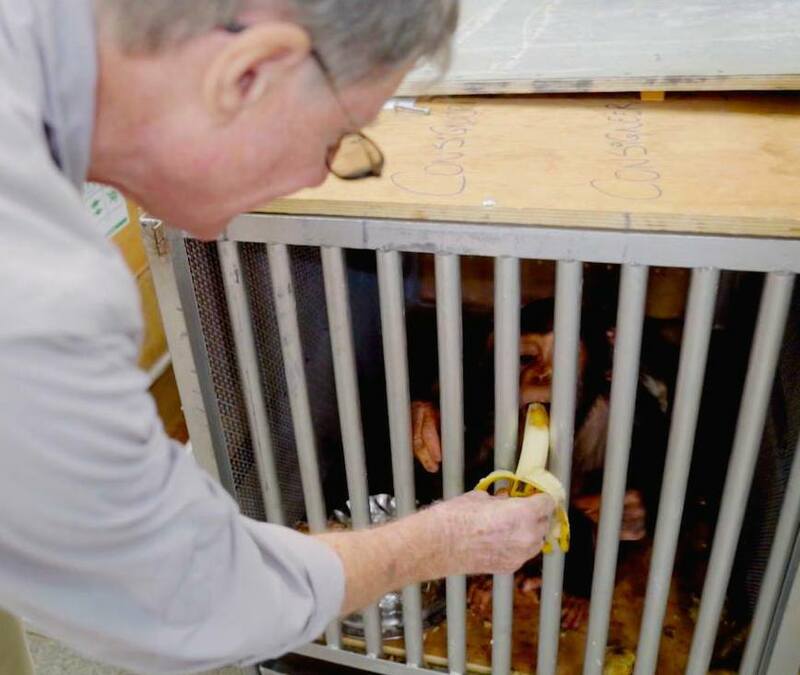 Bella had no food left in her cage, so I went to a nearby cantine and found the last three bananas. Bella scoffed two in no time, I gave the other to Bo. After more than seven hours in the airport we left for Ol Pejeta. Ramat was still doing paperwork, but they let us leave. 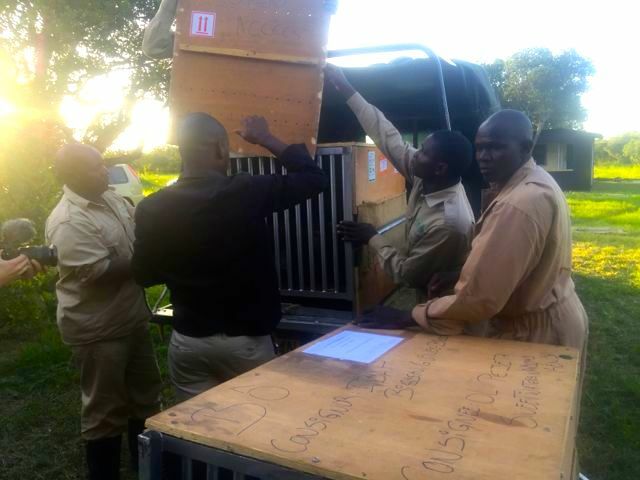 The chimps didn’t arrive at the Ol Pejeta chimpanzee quarantine house until 5:30 p.m.
Unloading at the quarantine house, directed by Joseph Maiyo, caretaker supervisor (man in hat). Clean straw for sleeping nests had been put in the rooms. Bo checks out his new home. 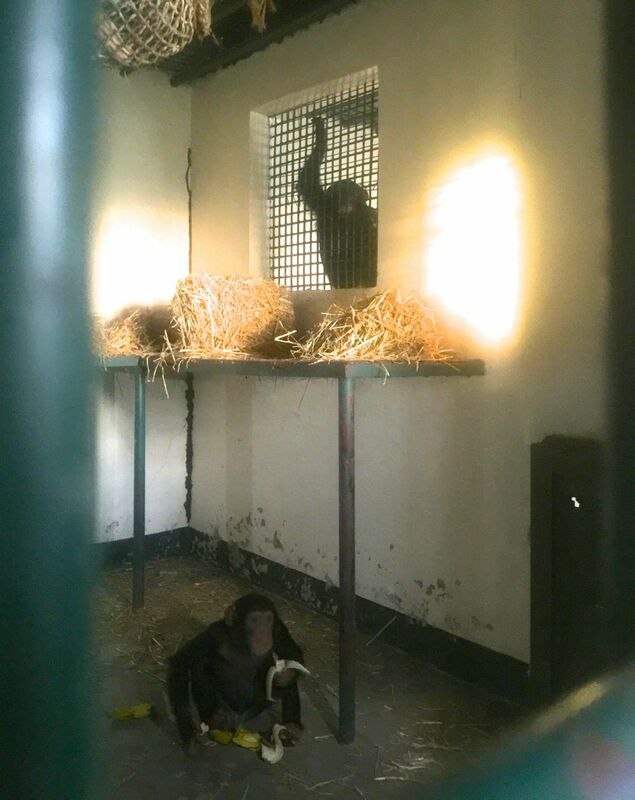 While Bella munches bananas, Bo watches from the window. We hope they will get to know each other through the window. 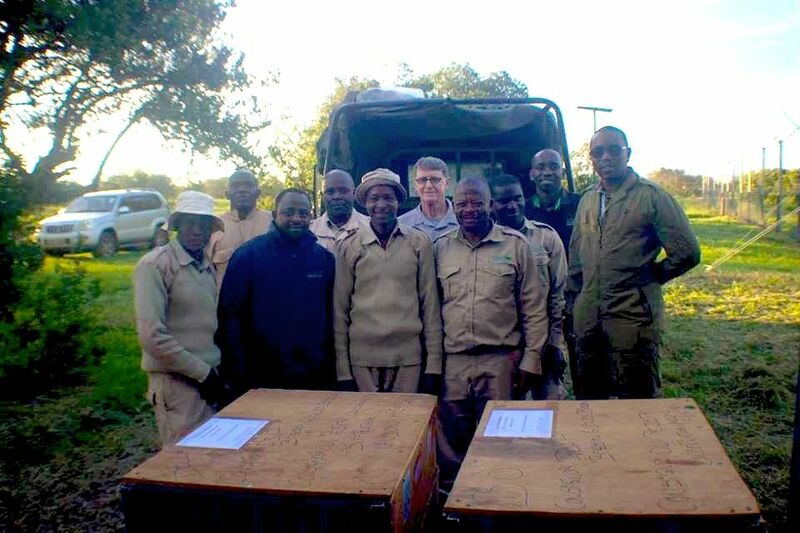 The team, very happy to have new guests at Sweetwaters Chimpanzee Sanctuary. 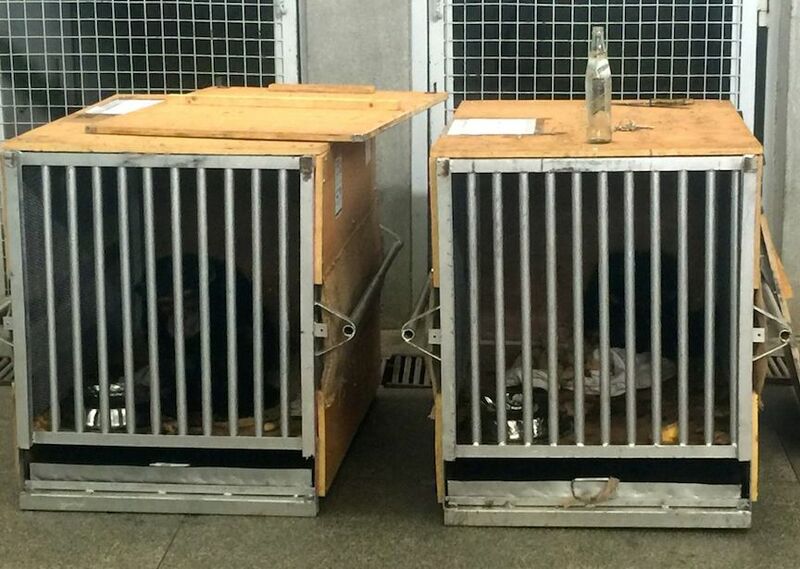 Bo and Bella will now enjoy five-star accommodation for the next three months in quarantine. Once out, we hope that they will be introduced easily to the New Group. 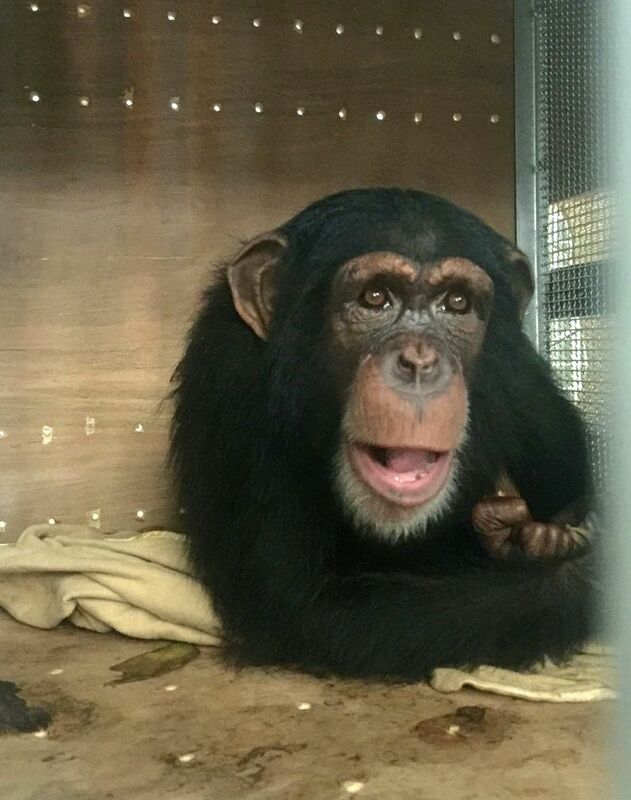 They will join Manno, the young chimp rescued from a private zoo in Iraqi Kurdistan and brought to Sweetwaters on 30th November 2016. 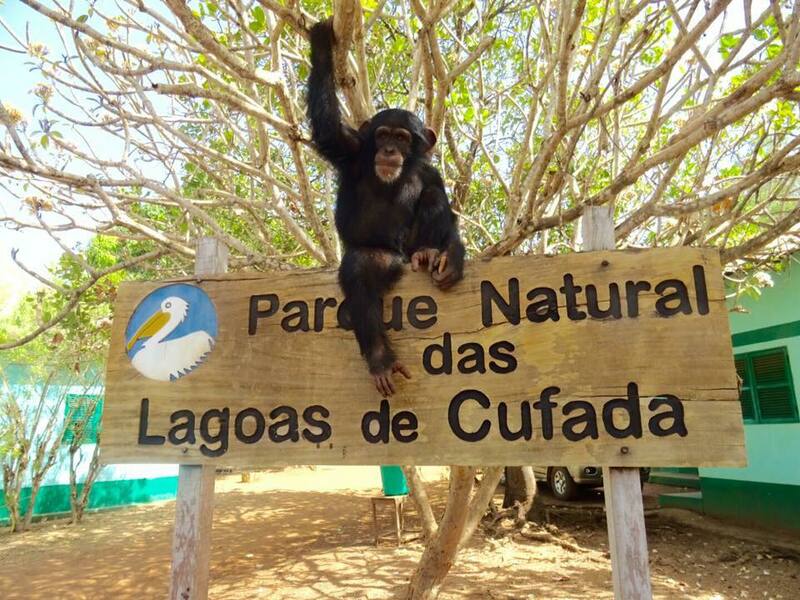 This entry was posted in chimpanzee, live rescues, PEGAS and tagged chimp rescue, Guinea Bissau. Bookmark the permalink.